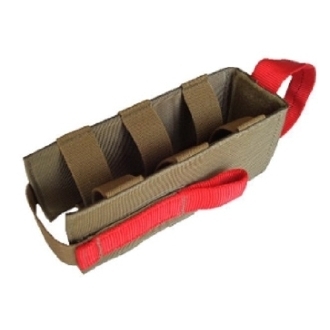 The Low Profile Medical Insert is designed to work with the ATS Low Profile Chest Harness, but it will work with almost any similar sized small pouch including ATS's Small Utility Pouch. It is a simple clam shell configuration that will hold just enough medical kit to treat severe trauma wounds. A red pull handle and Velcro-closed securing strap help to designate the Insert as carrying life saving supplies. The interior features six loops of heavy duty one inch elastic, three per side. Each wing of the insert has a piece of high density polyethylene (HDPE) to provide rigidity. The Insert measures about 7 inches long and is about 3 inches wide. It's about 2 inches deep, but its hinged design will allow it to hold quite a lot of supplies.